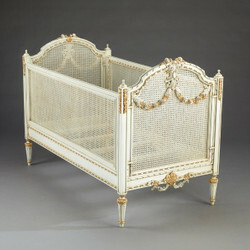 We at Casa Padrino are very happy to offer you a great collection of beautiful children's beds in baroque style and other styles. All beds from our collection are available in different colors, such as antique white with integrated gold applications available. In addition to our immediately available items, we also offer you the opportunity to meet your individual wishes completely and fully. For individualists there are no limits. For your special requests just call us by phone + 49-201-36577485 and our qualified sales team will take care of your special requests. All beds are handmade, made of solid wood and are guaranteed eye-catchers!